I missed “talking” to you, and taking pictures for you, and reading about your adventures, and leaving my poor approximation of witty comments. 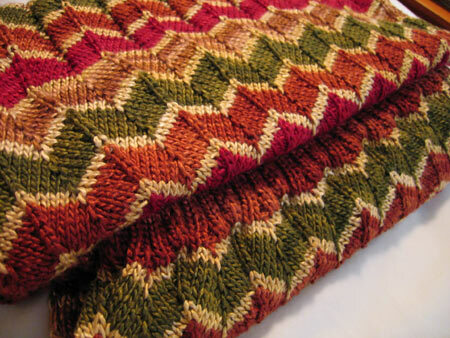 Pattern: Egyptian style dress for Annie Modesitt‘s new book, Romantic Hand Knits . Yarn: Tilli Tomas Pure and Simple, 100% silk, 3 skeins of Burnt Orange, and 1 skein each of Glazed Ginger, Ruby Wine, Moss, and Rattan. Needles and gauge: US 4 secondhand needles from eBay (Boye? 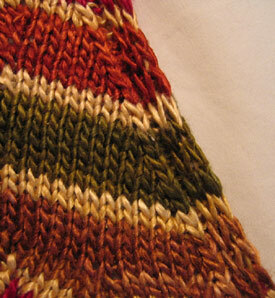 ), 6 stitches and 6 rows per inch in pattern. This gives you some sense of the scale of the dress. I think it won’t be quite to the floor when worn because it will stretch horizontally on the model, and she’ll probably be taller than I am. Of course I can’t model the dress for you – it’s not my size. Plus Annie will be doing the finishing herself (closing the top of the slit, attaching the straps, etc.). Knitting for Annie is always more of a luxury than a job. It’s like, are you sure I should be getting paid to do this? I get to play with this luscious yarn, and you pay me??? At least that’s what runs through my head, being very much a process knitter. Please keep in mind that this fabric has not yet been blocked. Left picture: left-slanting decreases are made by SSK on the right side. Right: right-slanting decreases are accomplished by p2tog on the wrong side. I enjoyed this project very much. In my honest and critical opinion, this dress is stunning. The yarn is amazing, and the resulting fabric is very deliberate – just the right union of stitch pattern and yarn, overlaid with the right color combinations and silhouette; not haphazard at all. There were only a few moments when the skies were cloudy: first, and this is my own fault and was totally within my control, I was a bit rushed at the end. In the last 6 weeks or so, I’ve been working on this dress any spare moment I had, at the expense of other projects and sometimes showers :). Second, switching colors while in pattern was very tricky, specifically a stitch pattern which incorporates yarn overs and slipped stitches and intarsia and all that. Is it impossible? Obviously not. Third, the dress got a little unwieldy towards the end (it weighs about 1.3 lbs). But it’s a big project, that’s all there is to it! Maybe I should’ve rigged up a Lazy Susan or something to keep it turning while I knit in the round ;). So, the question you all want answered: would I wear it myself? No. Knitted dresses are not for me. But do I appreciate the beautiful design? YES. The dress looks absolutely fantastic! Colors beautiful, yarn yummy. I, too, am not a knitted dress person but looking at it makes my fingers itch to make one. I’ll just add it to the (ever) growing list of things I want to make. When I’m about 65, it should be at the top of the list! LOL! Very impressive! I’m sure you’re relieved and excited to be done with that project. I’m anxiously awaiting updates and stories on your other WIPs! Wow. WOW. It is beautiful. I’d never wear it, either, but I would MAKE it. I mean, look, it’s perfect. The colors are incredible, too. That is GORGEOUS! You should be bursting with pride in a massive accomplishment. Beautifully, beautifully done. Wow. That is just fabulous. Grumperina, you are awesome (and so is Annie). I’ve been missing your daily posts so bad that I’ve been reading your archives just to get my Grumperina fix. Best wishes for a happy sewing class! I’ve been wondering what was up with you! Now I know … it’s like that when you have a real deadline to meet. I am suspicious of knitted dress and skirt too … I mean it’s one thing to look at them being modelled by a slender girl but totally a different matter to be worn by myself! It is truly gorgeous. And on the right person, it would be stunning. Clearly, not me, though. Congrats on a job most excellently done. That is fabulous. If only I had the body. I’d make it and wear it. we’ve been missing you! I can’t wait for all the posts as you update! That will be stunning on a model that looks like she has not seen a decent meal in weeks! I knit one dress – no gauge knit for me – substituted yarn on the say of the clerk in the LYS. Well the dress was a shirt waist style, fit below the knee when first on the body at noon and by dinner time at 5:00 pm, it was mid calf. By bedtime it was almost a ‘maxi’! Never again, and by then I disliked the yarn so much it went to the Sally Ann. Welcome back from test-knitting exile! 😉 Worth the effort, I’d say. We missed you too! I love that left-slanting decrease solution–totally pragmatic. Congratulations on finishing! it looks great. That is absolutely gorgeous! Congratulations on a job well done. Yay, you’re back! Lucky us! As for the dress, I’d certainly wear it. Congrats! Looks fabulous. Can’t wait to hear about all the other stuff. I use the k2tog on one row followed by the p2tog on another and I think the result is great. I’ll have to check out Nona’s solution, too. Can’t wait to hear about the needles from Knitpicks. So nice to have you back! I missed your posts! And the dress, of course, is stunning. Hubba hubba! I would SO totally wear that. With certain garments, it could be really killer. Annie Modesitt: I worship your design flair! Gorgeous, such good work! In my opinion, you’re quite the trooper to agree to knit such a HUGE project for someone else, being a project knitter or not, and wether or not you get paid. I’m waiting to hear about the KP needles, too. I ordered some, as well, but they were (expectedly, considering the price and amount of advertizing) out of stock of certain sizes already, so my order won’t be arriving quite yet. Good luck to your sewing class -you can do it! Just a word of caution; in my experience Burda runs a little big, so make sure you measure everything twice before starting to sew. Congratulations on finishing! Very exciting! It will be fun to see this in the book and say, hey! I know who knit that! I think Annie is one of the most clever designers out there. Gorgeous. I’m glad you’re alive and well. I was starting to worry about you. Wow the dress looks amazing – any chance we’ll actually see it on a person at some point?? Love the colors & the pattern is awesome! Congrats! I couldn’t resist commenting, and maybe it is just me or the way that first picture looks, but that pattern looks strikingly like a Jaywalker. Seriously, is it just me? Your progress shots and thoughtful notes on this project are the best advertisment the book could hope for! Looking forward to seeing it, even though the very IDEA of a knitted dress sends shivers up me timbers. Me very sturdy timbers. Congratulations on finishing–it’s beautiful. I’m rather jealous that the dress you got to knit was so much more interesting than the dress I got to knit. My fingers and brain were numb by the time I finished mine. Do you think anyone else will ever knit the dresses? Knitters who I know and who saw me toting the dress around for weeks said that they would never knit it because it was so huge. Beautifully done! What fun, to get paid to ‘play’ with luscious silk. I had a feeling you were engrossed in “the” dress. OMG, its sooo beautiful; if I wore a hat, it would be off to you!!!! What a job! Haha we missed you too! The dress is absolutely stunning, I can imagine how you’d be eager to get onto other projects though. Oh, and thanks for the link to Nona’s site – if my SSKs looked as nice as yours, I could try the P2tog-on-the-WS solution, but my K2tog’s are so much neater and prettier that I really think it’s the left slanting decreases I need to change. But I will definitely try her method – it’s so deceptively simple! I’ll have to echo the sentiments of others and say that the dress is absolutely stunning, and I want one! Not that I would wear it, probably, but it’s so gorgeous! Ah! I had a feeling when we didn’t hear from you for a few days that you were banging out the end of this dress – and what a LOVELY job you did, too! You must be so glad you are done, though! And you should invent the knitting lazy susan, I know I could use one!! Oh my. That looks like pure luxury to knit, and to wear. Thanks (to you & Annie) for letting us see the almost-finished dress. Gorgeous. And I’m selfishly glad that you’re back to more regular blogging. You are, aren’t you? drop.freakin’.dead.gorgeous! Congratulations to you and to Annie! Beautiful as always. And look at the sheen of that silk. I’m so happy I picked up some for myself. A beautiful dress with amazing detail. I’m looking forward to Annie Modesitt’s new book. Another job well done…way to go grump! I gave up sewing umpteen years ago. At one point in my twenties (and weighing a mere 115 lbs.) after making all my skirts and pants for work I decided to embark on a suit. Vogue’s sizing was always perfect, so I cut and stitched away on imported English worsted without measuring the patterns. Thin as I was, a size 6 fit a child’s size 10. My last sewing endeavor for me — only kids clothes thereafter! At least we knitters can swatch!!! Congrats on finishing! It looks stunning. Annie’s designs are so ingenious. Love the attention to details. I’ve been a big fan of your knitting blog for a long time, but have never commented, since so many others do a great job filling up the space. Great job on the Modesitt dress – I’m a huge fan of hers too. The pattern will totally match a pair of Jaywalkers! Dec’s: I like the k2tog on the front, ssp on the back, if the pattern can be modified that way. 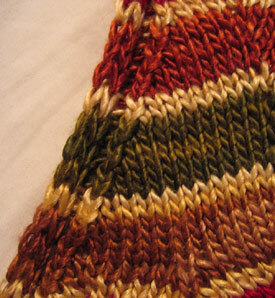 I learned from Hiatt’s “Principles of Knitting” that the yarn path of the ssp is exactly like the k2tog – nice and tight. Look forward to the Knitpicks needles review. Keep up the good work! This is beautiful. I don’t know if it would look really good on anyone who isn’t very tall and slender, but I certainly appreciate the colors and the pattern. Have fun at sewing class, let us know how it goes. I think the dress is wonderful. I too really like the decreases. I enjoy your approach very much & I’m glad you are back posting. I missed you. I just finished my first pair of Jaywalker socks. Lovely pattern. I used Lorna’s Laces yarn. It makes a wonderful pair of socks. Terrific! Boy, did we miss you too! Congrats on finishing the dress! All in silk? Ahhh…. I won’t knit a dress for myself, but I would happily wallow in that silk for … well, forever. Incidentally, I got my first order of Knitpicks needles and am using them on a pair of cotton/lycra (Greenwood, natch!) toe-up socks. I really like the needles very much – more than I expected to. I ordered dpns AND circs, but have yet to try out the latter. The dpsn are wonderful however. Wow! I can’t wait to see what else is in this book. I know I’m being rude, but…How much did you get paid??? Sorry! Wow, that’s an amazing piece of knitting. The details are great. I love reading your blog because I feel like I learn so much! I’m sure I would look like some strange sort of oompa loompa wearing it, but I think it will be stunning on whoever is chosen to wear it. Gorgeous! Congrats on finishing it and so quickly, too, it seems like I was just reading about you starting it. As for wearing it, I would, in a flash, I love knitted dresses. I love this dress! I would absolutely wear it. You did a great job. I would love to see a shorter version too.